After seeing these on Dara’s blog, Gen Y Foodie, I was smitten. We needed to make them. But instead of being all responsible and healthy with the olive oil and flax seeds, I went with good old butter. We love butter. We love Julia Child’s "Mastering the Art of French Cooking" for that reason. So back to the cheez-its – It is exciting for some reason to make a homemade version of packaged food item. Especially in this case, the buttery, cheesy crackers emerging fresh from the oven makes for such a lovely snack. Now Seth likes to destroy this delicate harmony of the home-baked cheddar cracker by actually dipping them in this ridiculous store bought cheese dip. If you notice, it isn’t even packaged in a jar. It is a tin can that you open like a can of cat food. Super classy. He swears by it. He claims that because the cheez-its taste so strongly like cheese, it helps to dip them into something that doesn’t taste anything like cheese… like pre-packaged cheese dip… While this is the dip he grew up with, and sometimes you just can’t fight nostalgia, I think we’d both agree that these crackers taste great with almost any dip. In a small bowl, mix together ½ teaspoon kosher salt, pepper, paprika, powdered mustard, and onion powder. In a medium bowl, mix together flour, cheddar, and the seasoning mix. Add the pieces of butter and using your fingers work the butter with the flour mixture until it resembles coarse crumble. Add 6 tablespoons ice water, adding more if needed for the dough to come together. You might want to use your hands to work the dough into a large ball. Refrigerate for 1 hour. Heat oven to 350. I like to roll the dough out on a Silpat or parchment paper cut to fit a baking sheet to get the right size thickness (about 1/8 inch), and then transfer the Silpat or parchment to a baking sheet. If you aren’t using these, the dough should be rolled out to roughly fit a baking sheet. Use a pizza cutter or fluted pastry wheel (gives that nice deckled edge) to cut the dough into squares. It helps to use a ruler to evenly space out the cuts. Use a chopstick to make the classic hole in the center that store-bought cheez-its have. Sprinkle more kosher salt on top then bake for about 20 minutes. You want the crackers to be crisp, but not burnt; you may wish to remove the outer couple rows, then put the pan back in and finish the inner rows. Once they are done, use the same pizza cutter or fluted pastry wheel (lined up with your previous cuts) to separate the crackers fully. I have been WAITING for you to do these! YUM! Although no cheese in a can, thanks. LOL! My mom was hopelessly and completely addicted to cheezits when I was growing up. I could never understand it as they looked awful to me. However, these look very tasty and fresh. I love cheese so I would probably fall for these fast. These look awesome! They are so flaky! I'm sure I'd love them! Thanks for the shout out! How amazing are these? I had to make three batches because we kept eating them before I could take pictures. Now you're making me crave more. Yesss!!! 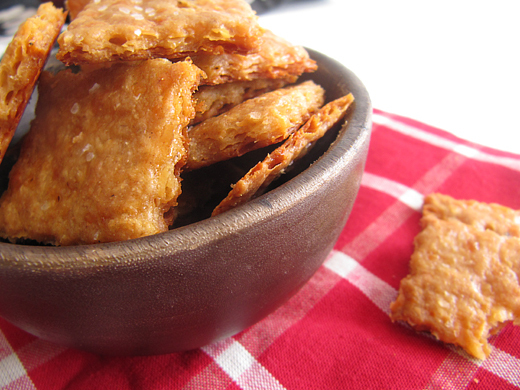 Love cheez-its and cannot wait to try this homemade version! I haven't had any desire to eat Cheez-its since I was little....but I want these!! They looks so good and addicting. Yummmmyy! Oh, my...these look so flaky, crisp and fabulous!!! YUM! Not sure I've ever had a Cheez-it! Your version looks delicious, brilliantly crispy! Making crackers is a fun project and this particular recipe does look like it packs in such great flavor! I would be happy eating them as is. Delicious post! Yum on the homemade cheez its! I wonder how they'd be with a bit of spicy Cajun seasoning :) Those look so great and crisp. Oh these ares so cute, I love all that cheese!!! I want a hand full so bad!! And yay for good old butter ;) awesome post! I love the challenge of making a childhood favorite snack at home and cheez-its have been on my short list for a while! Had to laugh at that cheese dip...but like you said, you can't fight nostalgia! Smitten is the word for these. They look fantastic and nothing is better than homemade. Saving this. I love butter too! Who doesn't? Pfft. Your recipe is perfect! I hope you have an amazing week and thanks for the recipe! So crunchy and delicious!Perfect snack for anytime :)I love the fact that you used whole wheat flour! !Healthy as well :)Great recipe Jenn! I am a cheese lover to the bone so these treats are just the right thing for me! I feel like I can snack on those all day. Great photos! I would love to have that during my tea break. These look incredibly good! I've been wanting to make them myself forever. I'm insanely jealous. I could plow through the entire bowl! So tempting. I have always had a thing for Cheez-it's. Put a box in front of me and I can eat the entire thing. Of course now I wake up the next day swollen from all the salt. That said, I'm intrigued to see if these taste like or even close to the real thing. Of course they might be even better. What do you think? Oh and because I love them so much my mom keeps a box at her house for when I stop by. I almost always hate myself after leaving there. I just can't control myself they're so yummy and addicting. Cheeze its are one of my favorite crackers. I wish that bowl was in front of me right now. Homemade cheese-its? How cool! My son loves cheese-its rather than other cheddar cheese snack. I feel better feeding homemade version but I don't have much time to make. I will save this recipe and maybe summer time I can make it with my kids! Thank you! Girl, I remember you talking about these a couple of weeks ago. Yay! I can't wait to try this recipe. I love me some cheez-its. I bet they're better when they're homemade. I love crunchy snacks! Making your own Cheez-its? Brilliant! Pinning this because I want to try it!!!!! Oh, this makes me remember how much I loved Cheez-Its during college. I haven't had any in a few years, but now I can make my own thanks to this brilliant recipe :). Delicious but not for those thinking about their weight.